Our litigators – known as “Strategic Warriors” – harness the power of our Real Estate Pure Play to gain an edge like no other firm has done – or can do. The Firm has dramatic competitive advantages over other law firms in real estate litigation that make us completely different and completely better. This is because our litigators – known as “Strategic Warriors” – harness the power of our Real Estate Pure Play to gain an edge like no other firm has done – or can do. As a result of our relentless focus on the real estate industry, we know how the real estate world works, how it flows, how transactions are put together, what is important and who is important, and how people in the industry think. This is particularly useful when transactions turn into litigation, or potential litigation, because our expertise encompasses the entire capital stack. We not only know what we and our clients are thinking, but we also know what our adversaries are thinking and were thinking at the time the relevant documents were put together. We Work With The Real Estate Lawyers – for every real estate litigation we assign a real estate partner – to think – to advise – to brainstorm – to test out arguments – and to create new arguments and theories. We Are Strategic Warriors – we combine strategic thinking plus a warrior mentality to win our cases. We Are Not Afraid to go to Trial – we know the judges, the procedural games and, most importantly, how to win. Our Real Estate Group is on the Job When a Litigation Turns into a Workout - Our real estate and litigation groups work together as a matter morphs from litigation to a workout and vice versa. We Are the Best and Sometimes a Unique Choice for a Client That Wants to Take on a Major Real Estate Player – We are one of the only – and perhaps the only – law firms in the real estate world that is likely not conflicted and has the skill set to take on major players successfully. We Don’t Bait and Switch Our Clients – the partners you meet at the pitch are the Strategic Warriors who do the work, appear in court, strategize, and lead the litigation. We Don’t Run the Meter on our Clients – we escalate disputes and go to trial only when it makes sense for the client to do so. We Give 100% for ALL of our Clients – We work to over-satisfy every client, regardless of size and regardless of how long they have been with us. 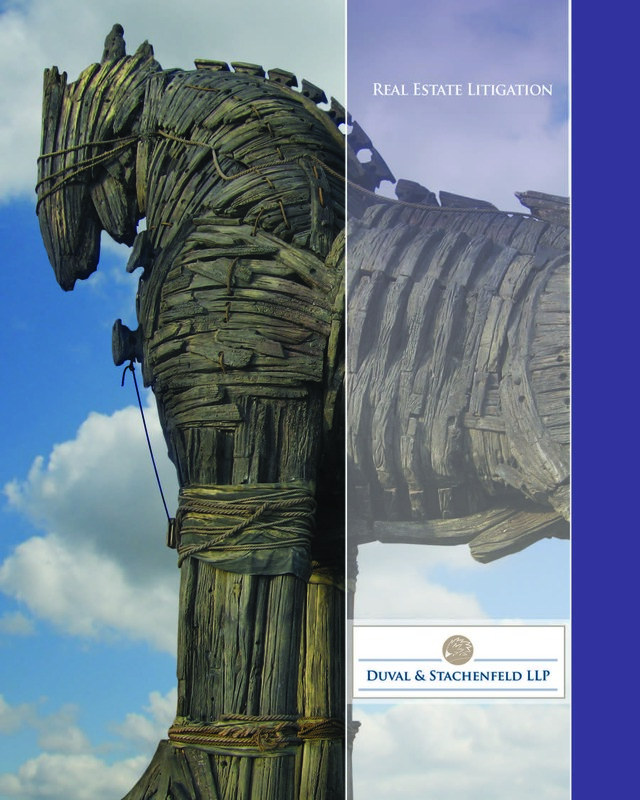 We Have A Mission to Help Our Clients Grow Their Businesses – we have deep industry contacts – with thousands of counterparties – which uniquely positions us to (for example) help find a potential “white knight” who might be able to turn a brutal litigation into a win/win settlement for all affected parties. Multi-Partner Brainstorming Sessions – if there is a solution, we will devote our full expertise and brainpower to find it. Fewer Conflicts – we are big in real estate, but a boutique-sized law firm. This means we are free of many of the conflicts that plague large firms. We have no trouble being adverse to large institutions. We Have a Hedgehog – we really care about our clients and lawyers and not just because the lawyers bill hours and the clients give us money, but because there is something special in the relationship which drives us to never let our client down. The Real Estate Litigation Practice Group is led by Strategic Warriors and partners Timothy J. Pastore and Kirk L. Brett.